This route begins at the water tower, away from the other buildings, surrounded with a forest. We will find it in the south of the whole complex. 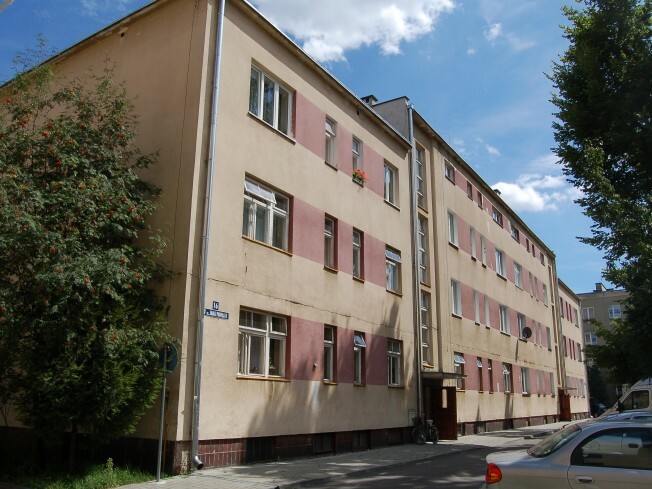 We leave the town centre (Rzeszowska street, near the bus station), go along 1 Maja and Mickiewicza streets (passing the first working class residential buildings – No. 1, 3 and 5) and then Sikorskiego street. After 1.5 km, just before the junction with Majdańska street, you will see the dome of the tower among the tree tops on the right side of the road. 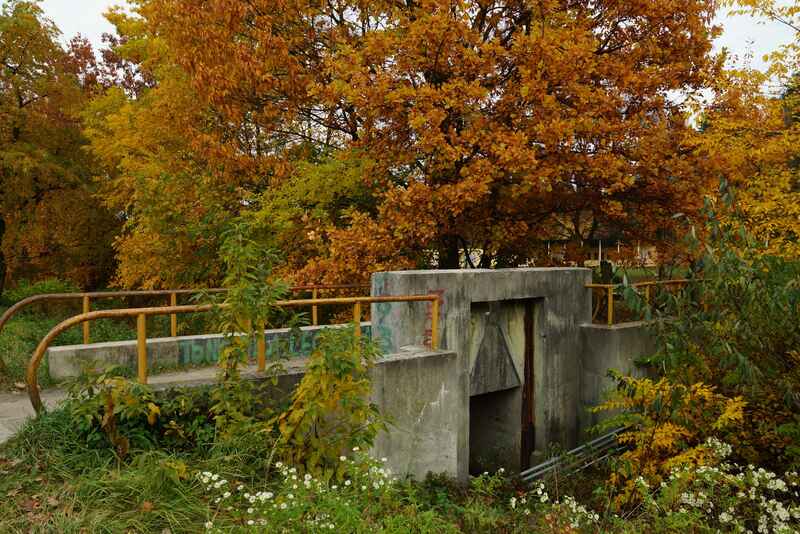 It was built in 1937–1939 for the Ammunition Plant No. 3. The construction of a deep water intake and a water tower was one of the first industrial developments in the area of Dęba (today: Nowa Dęba). On foot – total walking time: 72 min. By bike – total riding time: 20 min. After World War II, the tower catered for the needs of the town. Today, it is located in a no-entry zone, on the premises of the Dezamet S.A. Metal Plant, so it is not open to tourists. We can see it from the nearby footbridge over the railway line. The tower is surrounded by a forest, which is typical of Nowa Dęba. The town was designed to virtually merge with the forest, which used to be its protection. The water tower is an imposing structure – you would love to climb it. Perhaps, the authorities of the town will be able to turn it into a vantage point for tourists. Another site on our Route is the housing estate for Ammunition Plant foremen and its layout. The decision to build an ammunition plant in Dęba was made in April 1937. The plant was to become the main manufacturer of fuses and primers, as well as artillery shells and bombs. The Plant buildings (still being used as industrial facilities) are not included in the Route – you may watch them only from outside. The construction of the plant resulted in the emergence of a unique urban layout. To see its most attractive parts, we will go northwards, along Sikorskiego street, and then turn left into Mickiewicza street, and then left again, into Leśna street. The new residential estate was built on the River Dęba, whose course resulted in an irregular street layout. Thus, the axis of the foreman housing estate reflects the directions of the watercourse. The alternating chessboard-like arrangement of the houses has given the estate its unique character. As there were plans for the expansion of the estate, extra space was left for the prospective buildings. Anti-aircraft defence considerations were also of importance at that time. The housing estate has acquired its picturesque and private character due to its location on a flat woodland near the former Sandomierz primeval forest. The semi-detached houses, with ground floor-only, in Leśna street, were intended for the foremen. The flats had two rooms, a kitchen, a bathroom and a servant room, of a total usable area of 54m2. The houses had small cellars, and each flat had a separate entrance. There are no distinctive architectural motifs to talk about. However, worth noticing is the window woodwork, different than in the other buildings in the estate. The houses were given gently sloping lean-to roofs. Their garden façades, with no doors, faced green groves. Our Route runs along the Bystrzyk stream, near the workers’ garden allotments. We may take a look at the small footbridge, understated and simple in character, with the visible remnants of a lock. The rounded balustrade on the top of the bridge is reminiscent of naval motifs. At the intersection with Kościuszki street, the Route turns right, where the indoor swimming pool of the local-government-financed sports and recreation centre is located (14 Kościuszki street). The design of the sports centre included a swimming pool with a paddling pool, a sports field and tennis courts. 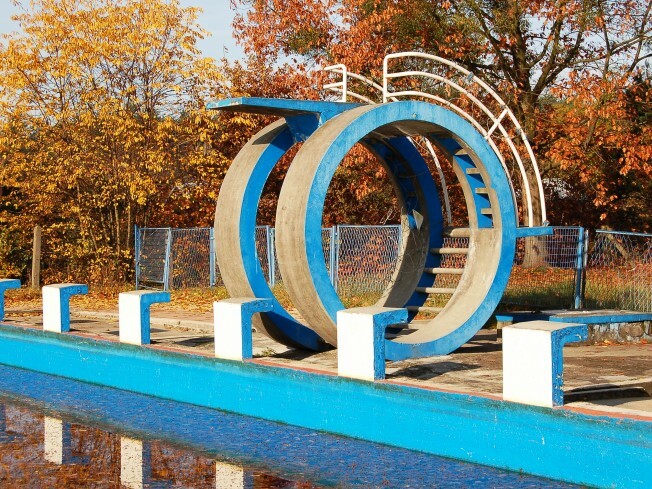 On the premises of today’s outdoor swimming pool, there is also a diving platform. Sadly, due to the present-day health and safety regulations, it is no longer used as originally intended. 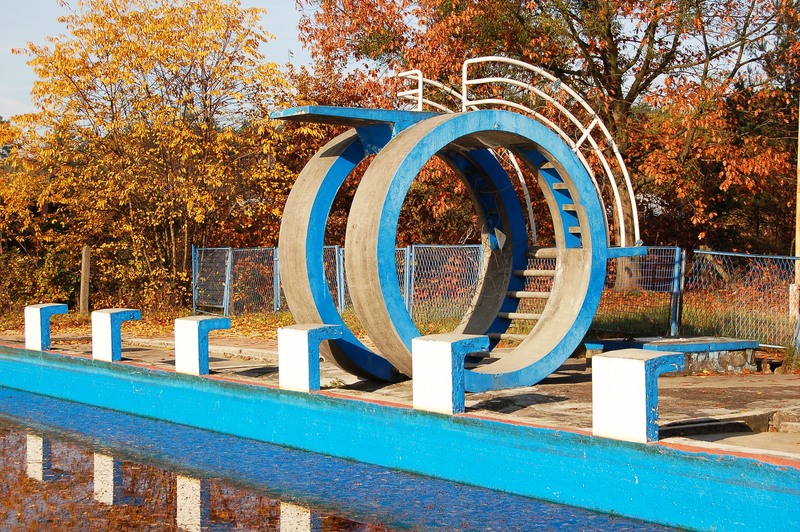 The Modernist design of the diving platform was based on the shape of a lifebuoy or a gun muzzle – the associations differ depending on the viewer’s perspective. An interesting accent is the dynamically led balustrade, and the entrance clasped by reinforced concrete hoops. 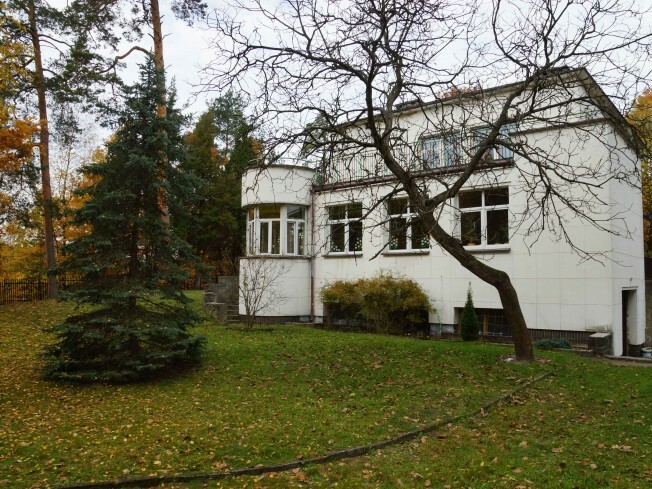 We go on to Szkolna street and turn into Reja street to reach the director’s villa, which was given a scenic location, on a small hill, amid ancient trees. 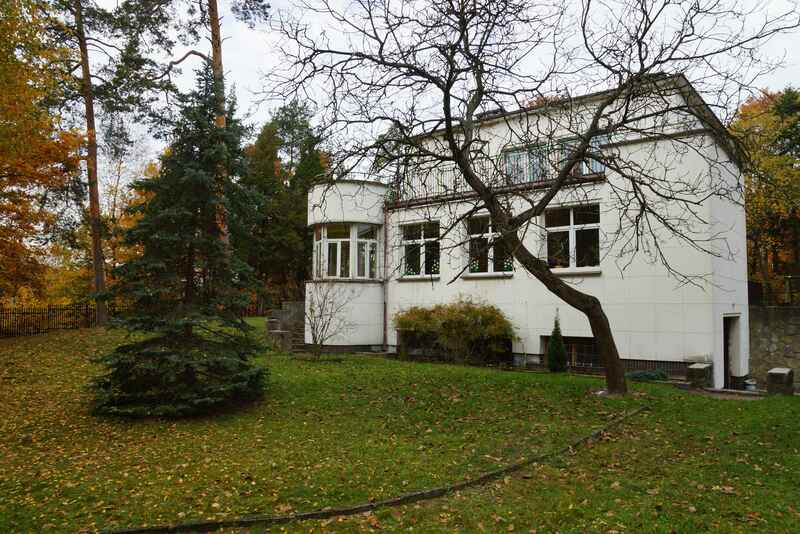 The luxury house, which followed the best examples of Modernist architecture, was the home of the director of the plant, Lieutenant-Colonel Jan Szypkowski. Its design made use of a wide array of then fashionable aesthetic and functional solutions. The ground floor offered a kitchen, a pantry, a buffet, a servant flat (with a separate entrance), a small toilet, as well as a dining room, a living room with an orangery and a study. All these rooms were accessed from a vast hall. Upstairs were three bedrooms, a dressing room and a bathroom with a separate toilet. The basement comprised a garage, a boiler room, a fuel and firewood store, a laundry, a drying room and other utility rooms. The building consists of two parts which merge with each other: the two-floor main body and the ground-floor only annexe, comprising daytime rooms and an orangery, located in the protruding corner apse, crowned with a full-blown balustrade whose shape is reminiscent of a captain’s bridge on a ship. The terrace over the ground-floor part faces the residential estate. Elegant finishing elements include the check motif on the plaster of all the walls of the house, the little retaining masonry walls and the entrance stairs leading to the house, offering an attractive visual contrast for the white-coloured elevation. 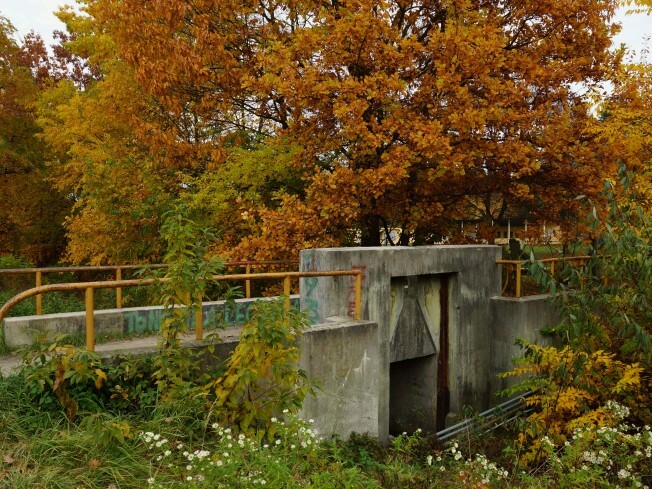 In the spring of 1941, the Nowa Dęba military training ground in was used by the Nazi Germans before their Operation Barbarossa and Stalingrad campaign. Field Marshal Friedrich von Paulus is supposed to have stayed in the villa, though historians approach this information with caution. Anyway, since the Nazi German occupation, the residence has been nicknamed “the Paulus House”. After the war, it was the seat of an outpatient clinic, then a school. Today, it houses an after-school club. It has been listed as a local heritage site. Another item on the Route are the blocks of flats for plant office workers and engineers, located closer the main street (Rzeszowska street). The construction of the residential estate began in the spring of 1938. The designs were supervised by the Technical Office of the Ammunition Plant No. 3. Their main author was the architect team leader Narcyz Szwedziński. The construction was supervised by the engineer Witold Thieme. There were 4 types of buildings, depending on the employee hierarchy. The buildings in today’s Mickiewicza street were intended for ordinary workers, in Jana Pawła II street – for engineers and office workers. Department managers’ residences, and a casino, were located in Krasickiego, Żeromskiego and Reja streets. Before World War II, only 200 workers and 160 office workers had found accommodation there, which was only a fraction of the figures in the plan. Each of the blocks of flats for the workers could accommodate 36 families. The usable area of these flats did not exceed 36 m2. They included two rooms arranged enfilade, a kitchen and a bathroom. Additionally, the flats had balconies, and shower blocks in the basements. 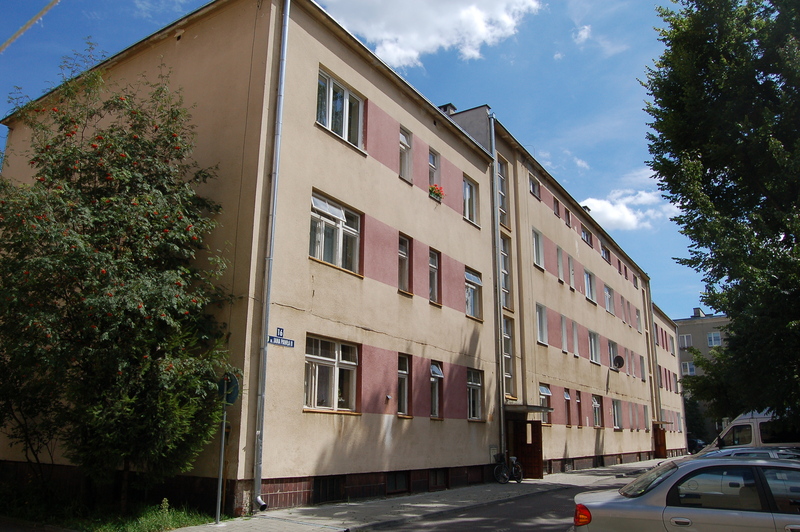 The two-storey-high blocks of flats for the office workers (in Jana Pawła II street) offered 18 flats of a usable area of either 73 m2 or 83 m2. They had two rooms, a kitchen, a servant room and a bathroom with a toilet. The blocks of flats for the engineers were also two storey high. They contained 12 identical flats, 4 per each floor. The residents enjoyed a vast hall, three rooms, a kitchen, a bathroom, a toilet and a servant room, of a total usable area up to 100 m2. The residential blocks were built on a strip footing, with a basement. The lower parts of the building comprised cellars, shelters or shower blocks. The attics were adapted for laundry and drying rooms. The final finish materials included terrazzo (the stairwell flooring), oak wood (floors in the flats), as well as glazed and terracotta tiles (in the bathrooms). The shape of the office workers’ residential buildings could be called monumental, as the raised central part produce an effect of perceptible heaviness. The stairwells have been emphasized by the elegantly set very tall and narrow three-section windows. The façade is marked by the window openings, whose sizes depend on the function of a given room. There are no decorative elements on the gable walls. The most interesting architectural solutions can be seen in the residential buildings for engineers, who were the most respected employees. Their block of flats was distinctive due to their raised stairwells, whose front elevations receded into the face of the façade of the building. Clasped by a rounded concave avant-corps, they are also accentuated by muntins. The composition axes thus obtained have been emphasized with balconies. From the rear elevation protrude the sections containing kitchen annexes, which – together with the arrangement of the balconies – has produced a sculptural feel to the modular subdivision of the building. The top of the front elevation has been marked with the small windows of the drying rooms. Once our walk over estate is over, we head for the bus station in Rzeszowska street.